When you think of states known for their fruit production, Montana is probably last on the list. However, parts of Montana have a rich history of fruit production including apples, pears, apricots, plums and cherries. Historically, orchards were planted throughout Montana by orchardists and homesteaders just trying to make a living. Although the orchardists and homesteaders may be gone, many of those orchards are still intact. Montana State University Extension is working across the state to identify and preserve those heritage orchards that still exist. One of the first things many homesteaders did after moving west and settling their land was to plant fruit trees. At that time produce did not ship well and was often very expensive. Therefore, eating locally was most likely their only option. If they didn't grow it, they didn't eat it. Because of their value, fruit trees and small orchards used to be a prized component of many farms, ranches and communities. There are still remnants of these successful fruit trees and orchards scattered around the state, hidden in little sanctuaries located off the beaten path. Some of these orchards hold prized trees of many old cultivars that may be over 100 years old and still producing. Imagine what we can learn from these heritage orchards, and how they can assist us in rebuilding localized fruit production across the state. The first step in preserving these orchards is locating them and giving them the recognition they deserve. This is where we need your help. Do you know of a heritage orchard or old fruit trees in your neighborhood or county? What constitutes an orchard to be designated as a “Heritage Orchard”? For a location to be considered as a Heritage Orchard, there must be at least 6 living trees that are 50 years or older. Preference will be given to locations that have more trees and are located in central or eastern Montana, at least initially. If the original planting date of the orchard is unknown, contact your local MSU County or Reservation Extension Agent for assistance. How does the landowner benefit from being recognized as a “Heritage Orchard” location? 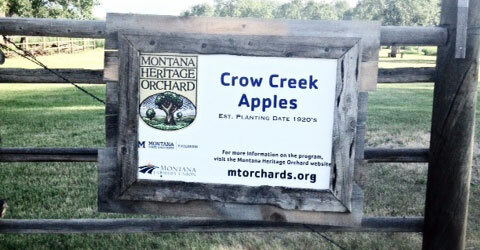 Each landowner will receive a sign designating it as a Montana Heritage Orchard (if desired). The sign will include the names of the owners, the original planting date, program sponsors, and the web site address where the map of all the Heritage Orchards can be found. If the landowner chooses, they may participate in the Heritage Orchard tourism efforts, giving them a chance to earn some revenue from the tourist traffic. If the landowner agrees and wants to participate in propagating the trees, the owner will receive a portion of the grafted trees, and a portion of any revenue that may be associated with it. We have a contract with a local propagator who will do all the grafting and distribution of the Heritage Orchard trees. MSU Extension will work closely with each orchard location on all aspects of the project. We have the ability through a lab at MSU to do molecular testing to identify valuable or unique fruit tree cultivars at the sites. Knowing which cultivars have been successful for 100 plus years will be valuable information for future orchard plantings. Every spring, a pruning crew of agents, specialists and master gardeners will be traveling around the state to the sites to prune the trees. Every location in the program will get pruning assistance at least once; hopefully more depending on available resources. How do I get my orchard recognized? Fill out the attached form, or contact your local MSU County or Reservation Extension Agent, and give them the information on the orchard. For a list of all the County Extension Offices and their contact information, visit this web site, http://www.msuextension.org/localoffices.cfm. The local extension agent will then work with the program administrators and follow up with each location. If the orchard is a suitable Heritage Orchard candidate, the program administrators and/or local extension agent will schedule a time to visit the orchard, and the orchard location will be placed on an interactive map administered through MSU Extension. While on the website, a map user will be able to click on each location and read about the history of each orchard. It will also include a list of all the identifiable cultivars at each location. MSU Extension will work closely with each landowner to preserve the existing trees, and propagate offspring for future generations to enjoy. Finally, in addition to recognition, preservation and propagation, the project will work to foster agro-tourism around these orchards for those who are interested. Agro-tourism is a growing segment of our State's economy and there is a prevailing interest among tourists to get off the beaten path and visit rural areas of the state. The Montana Heritage Orchard Program will encourage the public to visit these orchards, thus contributing to the rural economies. Participation in agro-tourism efforts is voluntary and is not a requirement in order to be in the program.